Gerber Extensive HA is a hypoallergenic formula designed to meet the nutritional needs of babies with cow's milk protein allergy. If your baby is suspected of having CMPA or diagnosed with CMPA your baby’s doctor might recommend changing from a routine formula to a hypoallergenic infant formula. 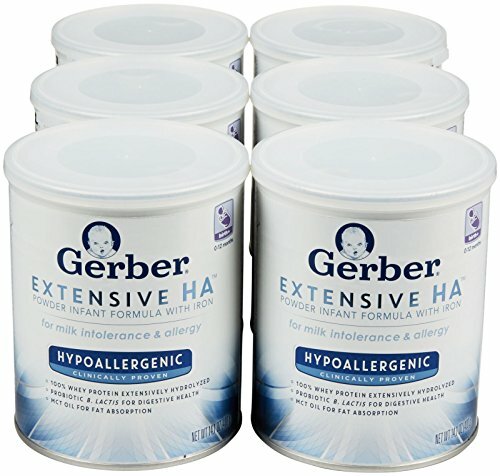 GERBER EXTENSIVE HATM has been clinically proven to be hypoallergenic. It is made with 100% whey, a high quality whey protein, extensively broken down designed to be well tolerated. GERBER EXTENSIVE HATM is the only hypoallergenic formula to feature B. lactis, a probiotic similar to those found in breast milk to support digestive health. Babies with cow's milk protein allergy have been shown to have a different gut flora than babies without cow's milk protein allergy. Feeding infants diagnosed with CMPA, an extensively hydrolyzed formula with the probiotic Bifidobacterium lactis has been shown to help promote a balanced gut flora. GERBER EXTENSIVE HATM has a unique oil blend made with expert recommended DHA for brain and eye development and Medium chain triglycerides (MCT), fatty acids that are well absorbed. It has all vitamins and minerals to support baby's growth.